It's not where you'd expect a National Waterways Museum to be - beside a chemical works in Cheshire - but there is a good reason. 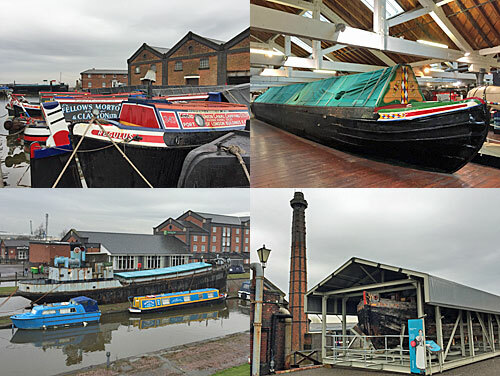 I note there's also a National Waterways Museum in Gloucester, and a Canal Museum at Stoke Bruerne in Northamptonshire... which used to be known as the National Waterways Museum, to complicate matters. But of these three sites operated by the Canal & River Trust, the admission charge in Cheshire is the highest, so I guess it must be the flagship. 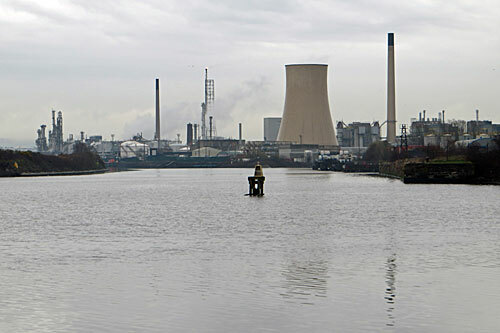 Ellesmere Port exists solely because a canal was planned between the Mersey and the Severn in the late 18th century. It was to be called the Ellesmere Canal, named after a small town in Shropshire passed on the way, hence the docks on the Cheshire marshes were named Ellesmere Port. The link was never completed, and the northern end metamorphosed into the Shropshire Union instead, but the name stuck and the docks grew to be bustlingly profitable. The Manchester Ship Canal cut through in 1894, severing the original connection to the Mersey, but bringing even greater trade. 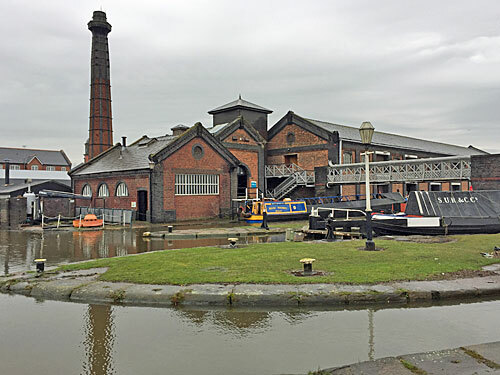 That's long gone, but Ellesmere Port's location at the junction of two very different kinds of waterway makes it ideal for a broad-ranging museum. 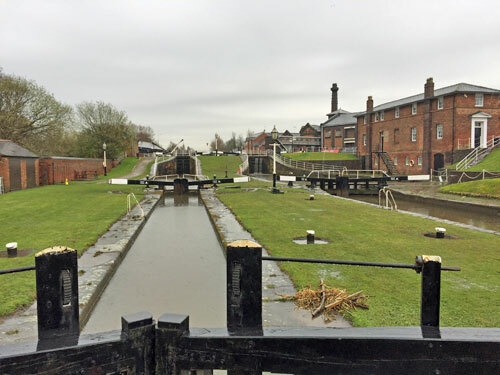 The NWM is based on a seven acre site sandwiched between the M53 and the Ship Canal, complete with two sets of locks and several large basins. Some of the surroundings have been gentrified Cheshire-style, with a Holiday Inn slapped on one of the quays and a private residential zone overlooking the lighthouse at the actual junction. It seems an odd place to want to live, overlooking flat estuarine nothingness, and with the chemical pipes of Stanlow Refinery flaring not far enough away. But the museum shields you from all that somewhat (so do remember to go and stare at the enormous Ship Canal properly before you leave). In good news, there's more to look around than there initially appears. Initially you'll be nudged down towards the slipway, where boats were hauled up from the docks for maintenance, and get to meet various 'characters' who once worked here. What you're supposed to do is stand in the right place and use an augmented reality app on your phone to bring them to life, but life's too short, and I found that reading the script on a nearby laminated sheet wasted far less time. There's also the option of walking round with a free audio guide, which might have been excellent but I turned down because it would only have kept me out in the pouring rain for longer. The main exhibit is inside three brick warehouses, today relabelled as the Exhibition Hall, with rather more tucked away upstairs than down. Here you'll find the full gamut of UK canalboating writ large, from reproduction boatyard toolsheds to painted narrowboats you can walk inside. It's often easy to forget that boating families were confined to a tiny cabin at the stern, with the majority of their internal space given over to precious cargo, rather than the luxurious full-length layout modern holidaymakers enjoy. Elsewhere all the canals' mechanisms and operational extras get a mention, for example painted jugs, mileposts and aqueducts, although if you really want to understand how locks work then best walk outside and inspect the real thing. The displays are never overly parochial, so although NW England and Wales get a good look in, the rest of the country is covered as well. I smiled when I found a photo of Rickmansworth in a digital display, and grinned more broadly when I found specific reference to Common Moor Lock in a temporary exhibition. 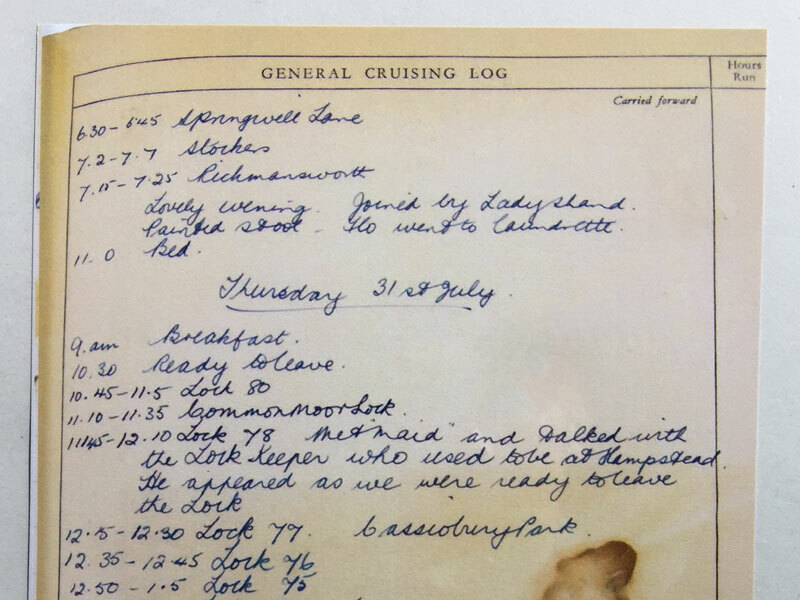 'No Sign Of Canals On Mars' showcases the cruising logs of Eileen Burke, a boater on the Lea and Stort in the 1960s, in appealingly sellotaped scrapbooks interspersed with newspaper cuttings from the Space Race. It's gorgeous stuff (and also available in a limited edition boxed reproduction). Nextdoor I had a go at the icebreaker challenge, where you have to rock your body for 30 seconds to smash through a channel of virtual ice, but only because I knew absolutely nobody else was upstairs watching me. It's not all about boats. The blacksmiths' forge which used to operate on site has been left as it was when the canal company moved out in the 1960s, and is still used to host day courses in smithing if that's your thing. Gentlemen who like greasy engines are well catered for in the former gasworks power hall, and also the enormous Pump Room, while others regularly get their hands dirty in the heritage boatyard. Another interesting diversion for visitors is the row of four dockers' cottages, each bedecked inside as it would have been in a different decade, from austere Victoriana to the almost comfortable 1950s. But mainly it's about the boats. Several are moored up around the site, with the larger specimens in the lower basin, and often with the opportunity to clamber aboard unsupervised. Had I turned up the previous weekend there'd have been dozens more as part of the annual Easter Gathering, one of the seasonal cavalcades which keep places like this alive. In better weather the museum also runs a 30 minute barge trip, with commentary, up the Shropshire Union and back. The NWM's not where most locals go at the weekend - the massive shopping centre one junction down the M53 has far more allure. But if you're reading this you'd no doubt enjoy the old boats better. 1) Cheshire Oaks is not everyone's cup of tea. Nor is it in Chester - it's a few miles away on the outskirts of Ellesmere Port. However, Britain's largest Designer Outlet Mall is a popular destination for the city's tourists. Parking is free, though you can book and reserve a space for £5 as the owners understand the section of their clientele who'd see things like a designer shirt for £95 as a bargain too good to refuse. For those of us that aren't like that, while most of the shops will not be for us, there are some high street retailers offering some products for slightly less than they do on the high street. As such, clearly no visit to NW Cheshire is complete without walking the ¾ mile around this shrine to capitalism.